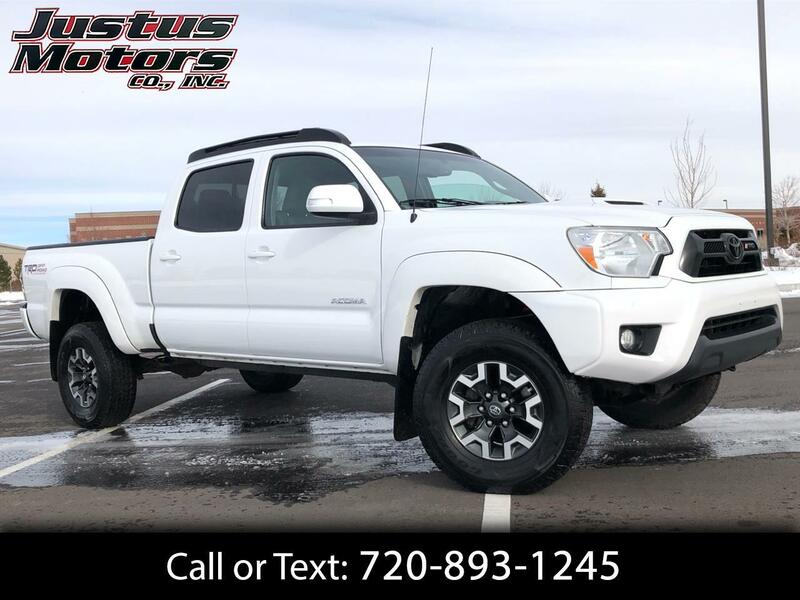 Used 2013 Toyota Tacoma TRD Offroad Racing Edition for Sale in Littleton CO 80120 Justus Motors Co. Inc.
Our 2013 Toyota Tacoma Double Cab TRD Offroad Racing Edition V6 4WD is shown off in Super Whit. Motivated by a 4.0 Liter V6 that offers 236hp on demand while mated to a 5 Speed Automatic transmission for high performance. This Four Wheel Drive Double Cab attains near 21mpg on the open road. Equipped with a sport-tuned suspension, you'll be able to handle any adventure in this sure-footed truck. Our Double Cab V6 has a reputation for looking good and working hard. With a blacked out grille, hood scoop and upgraded alloy wheels, this truck means business. You'll appreciate the convenience of a composite bed liner and a bed utility rail system for hauling anything. Keyless entry, a tinted sliding rear window, and a rearview camera are also handy. Once inside the spacious interior, you'll notice upgraded seating on front sports seats and a 60/40 split rear bench. A premium audio system with satellite radio. Safety is always a priority, and our Tacoma is equipped with ABS brakes, electronic brake-force distribution, brake assist, vehicle stability control, and traction control. This sturdy truck will make an excellent companion for you. Print this page and call us Now... We Know You Will Enjoy Your Test Drive Towards Ownership!